Spring in the Norwegian capital, Oslo, is the most beautiful part of the year, as the first season flowers bloom, the days are getting longer. I will the coming weeks share the progress of spring, here in the far north. One of the sights of Oslo in spring. 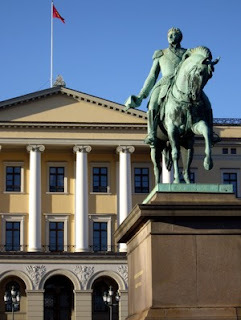 King Karl Johan on his of Sweden and Norway on his horse, in front of the Royal Palace, in bright sunshine! And the flag tells that his Majesty, King Harald V and Queen Sonja is home!